World Vision Xtrend ET-9200 HD Satellite Receiver an updated version of the popular model HD Satellite Receiver Xtrend ET-9000 HD. Tuner retains all the advantages of the previous model: the work on dual core Dual Core MIPS processor BroadCom BCM7413 400 MHz, on board the same 2 satellite tuner DVB-S2, which support the real functions PiP (picture-in-picture). Support features full 3D, adaptive deinterlacing and also high speed. RAM memory has remained unchanged 512 MB. 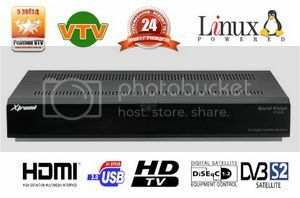 Xtrend ET-9200 HD Satellite Receiver Flash memory increased to 256 MB, Management is based as in Xtrend ET-9000 with Enigma 2 platform Linux, which respectively supports plugins like : YouTube, eMail, RSS, FTP, and other media players.